Innovations are sometimes born out of frustrations. 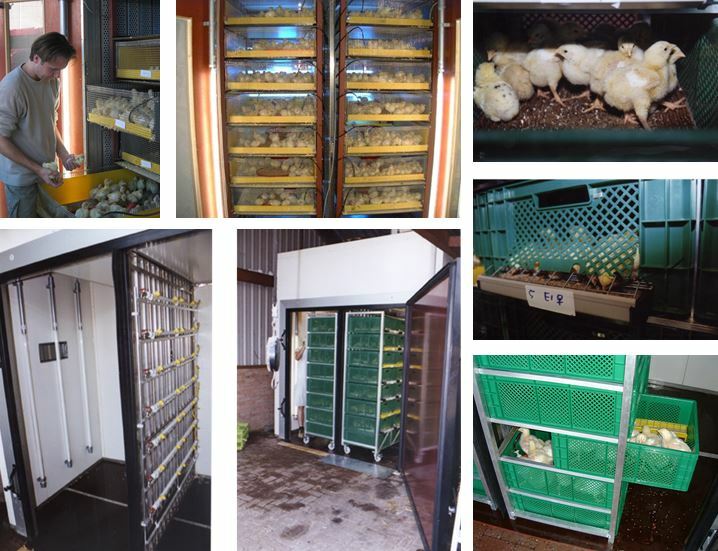 When incubator companies and hatchery staff do their outer best to improve hatchability and chick quality, it can be very disappointing to see that chick transport or broiler house management can ruin all efforts. On the other hand, when hatchery performance AND transport AND broiler house management is optimal, the overall broiler value chain results will improve enormously. 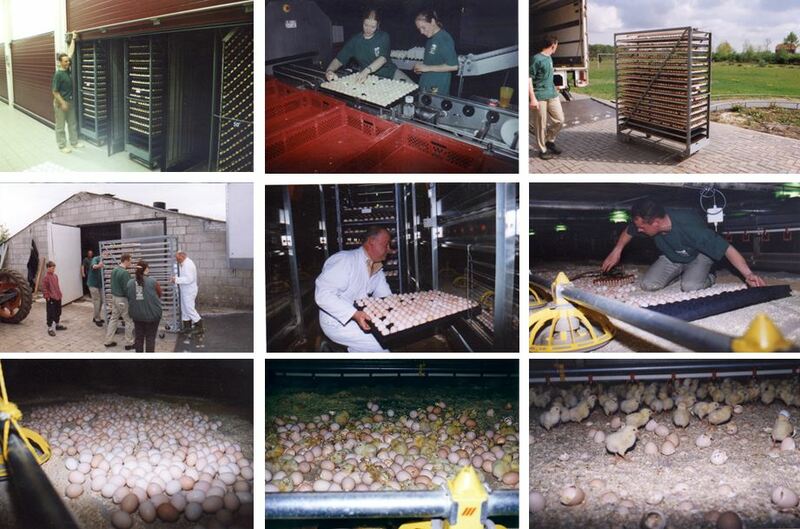 Broiler farmers largely depend on the hatchery with regard to the quality of the chicks they receive. Cross contamination in the hatch area and subsequent transport stress and delayed feeding will not contribute to chick quality and so inventions to avoid this can be very rewarding. 2) that you should ALWAYS measure and control egg temperature and chick temperature! With that as a basis, new steps can be taken to improve the broiler chain results further. Farm hatching and early hatchery feeding are perfect examples of new innovations that followed these two Golden Rules. To be honoust, all technical results will improve if you follow these Golden Rules, also traditional hatching without early feeding! Back in 1998, the three Kuijpers brothers came to the Poultry Research Institute "Het Spelderholt" in Beekbergen, The Netherlands, with the idea to hatch eggs not in the hatchery, but on the farm and at the floor. They developed "The Chick Mother", and tested this concept in the research hatchery. All eggs hatched out; and chicks had free access to feed and water - when ready for it. 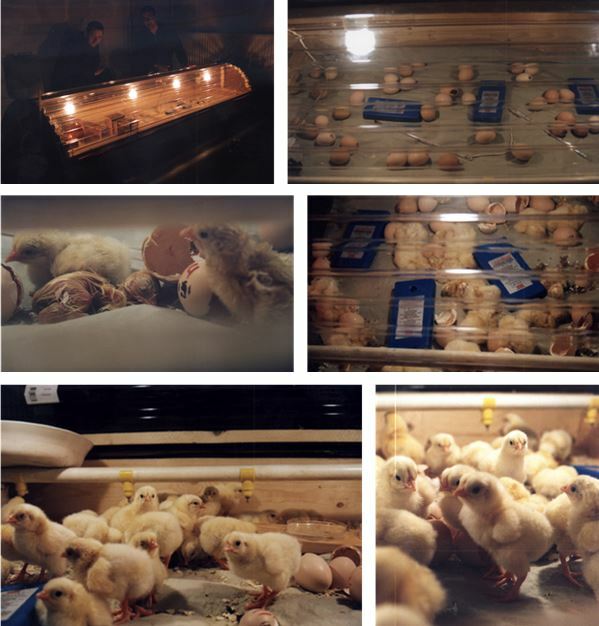 Above this, cross-contamination in the hatchery would be reduced, also chick handling stress and transportation stress would be no issues any more. The idea was great, but how could this be translated to large scale broiler farming practise? The next step was to test this out in the Poultry Best System, a housing system with 4 tier levels developed by Vencomatic. In the PBS temperature could be controlled to precise levels, comparable to the hatchery but with no air speed across the eggs. Based on calculations in "embryo temperature", the air temperature was set at 34ºC and adjusted if eggshell temperature deviated from 37.8ºC. For commercial farmers who don't have the VBS equipment, a different type of hatching / rearing system was developed. Candled eggs were transported from the hatchery at d18 of incubation and placed in this rearing system. After some days, the chicks were placed at the floor. This concept was further developed into the Patio system. 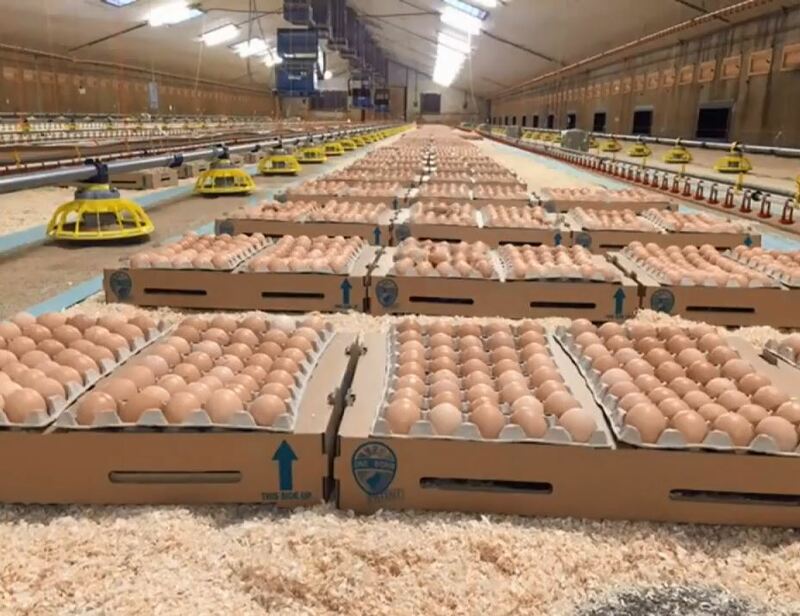 The Kuijpers brothers and Vencomatic agreed that the concept of on-farm hatching of eggs would be further developed and distributed by Vencomatic. The Patio was born, which was further tested at "The Spelderholt", the Wageningen UR poultry research facility in Lelystad (which is nowadays the research facility for Aviagen). 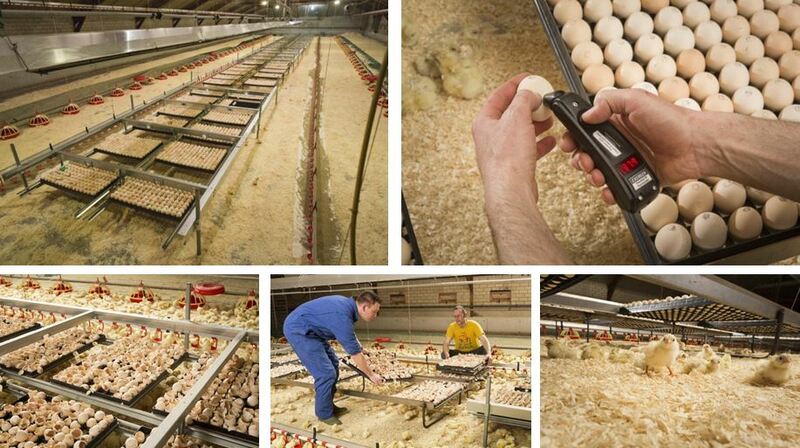 These days, several broiler farmers in the Netherlands adopted and purchased this concept. World wide, more than 20 million broilers are housed in Patio facilities. The Patio is a unique multi tier broiler concept, which is designed for hatching pre-incubated eggs (18d) in the system where the birds are also reared. 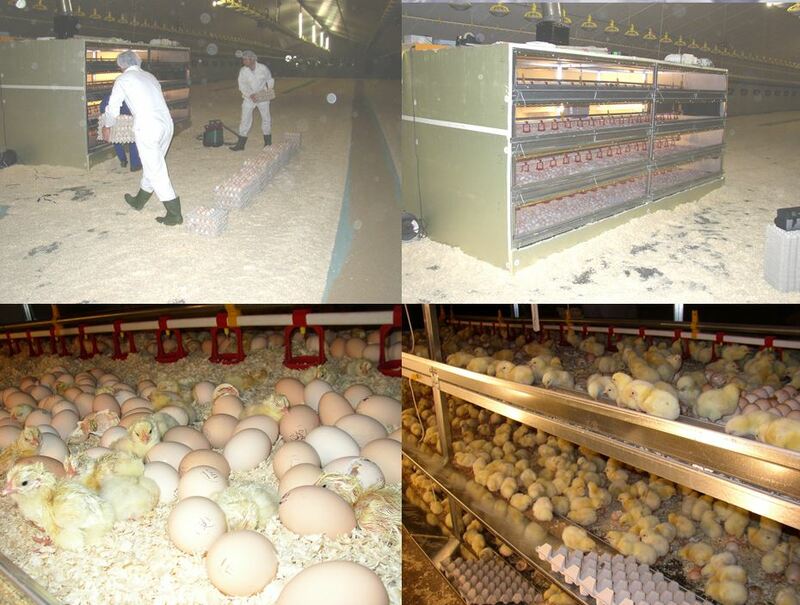 Each row of the system contains several levels where the young broilers will be housed. The broilers are placed on a manure belt, which also is used to transport them out of the house. Patio can serve as a rearing system where young chicks can stay for 10-12d before transportation to the grow-out facilities. Broilers can also be reared in the Patio for the full period until slaughter. 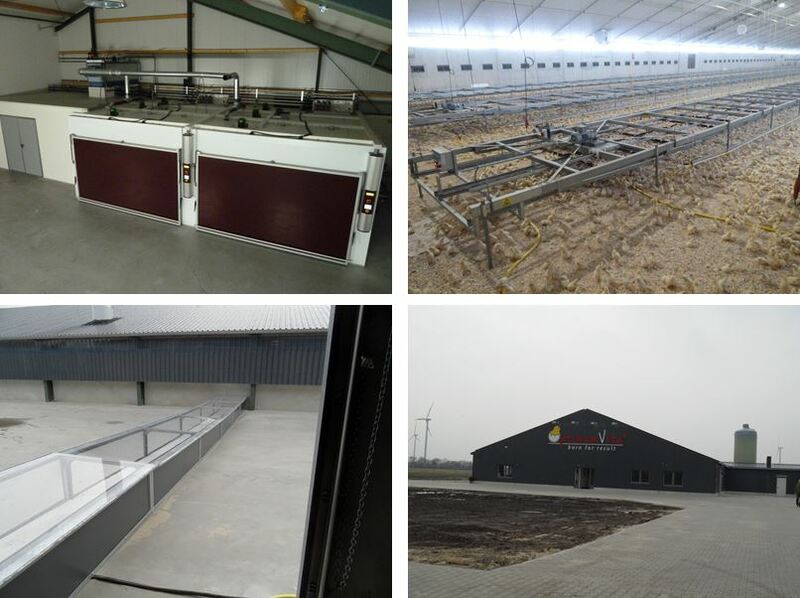 Another idea came from Klaas Knol, who built a new broiler farming system: Optimum Vita. In his concept, he realised a "pre care unit" where hatching eggs of known origin are incubated. These eggs are candled at 18d, and placed in the so called "high care unit" on racks. When eggs hatch, the chicks fall down in wood shavings and find feed and water immediately. After an age of 10d these chicks are moved to the "living", where they stay until slaughter age. Today, together with Hans Grootkoerkamp, Klaas is constructing a complete new hatchery in Germany. Optibrut is made out of glass so please no complaints about lack of transparancy. All chicks will receive feed and water during hatching using the Hatch Care system (see below). An other application is the One2Born concept. In this concept eggs are transferred at d18 to the farm, where they hatch on specially designed cardboard boxes. Check out this video, it is nice to see the hatching process on camera! 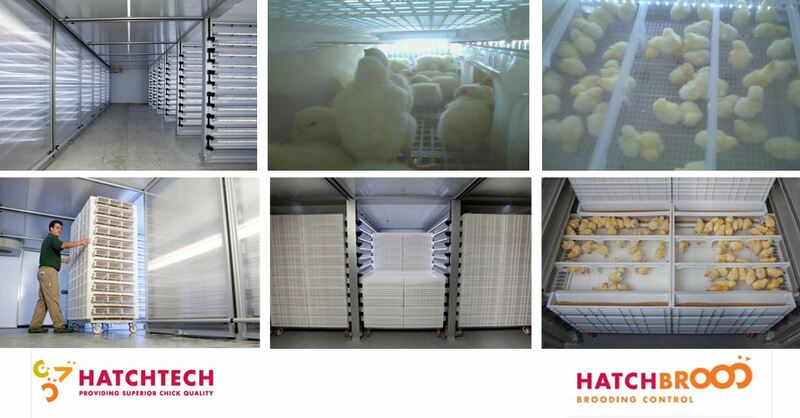 Simultaneously to the development of the on-farm hatching systems, incubator company HatchTech developed the Hatchbrood system. Their believe was that eggs need to be there where they receive the best care. And that is in the hatcher until pull time. After pulling, chicks should be placed under best circumstances, and that is a place where body temperature can be controlled, and where chicks can find feed and water. This combination gives chicks the best possible start. Hatchbrood is a rearing system adjacent to the hatchery, so transport time is very short. After 3-4d these well developed chicks can be transported to the broiler farms. This innovation also started with trial and error, in small scale experiments. During the years, Hatchbrood developed to a full commercial product which is sold to clients of Hatchtech across the world. Hatchcare is a complete new product from HatchTech. In this hatcher, newly born chicks are provided with water and feed. 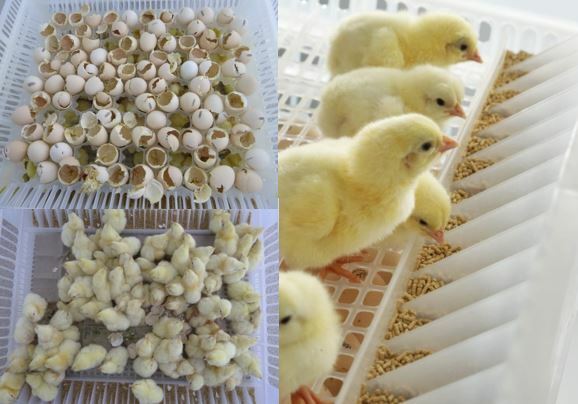 In traditional incubation, post-hatched chicks are in the hatcher without feed and water for a minimum of 24-36 hours (hatch window–processing–storage–transport) before placement on the farm. According to HatchTech, the supply of feed and water within the hatcher has scientifically proven benefits for post-hatch growth, development of the digestive, immune and thermo-regulatory system. It is still unknown however how fed day old chickens respond to different transport conditions and (rough) placement at the farm. When chickens switch from endogenous feeding to exogenous feeding, they start up their digestive system and enzymes are being produced. 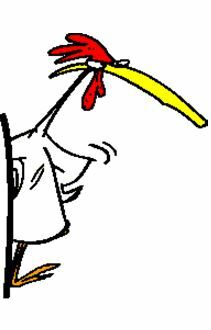 Chickens in transit may not eat, and with empty stomachs and guts this may lead to erosions in the digestive tract.